Meppadi is one of the most scenic hill stations in the Wayanad district of Kerala and is located around 13km south-east of the town of Kalpetta. 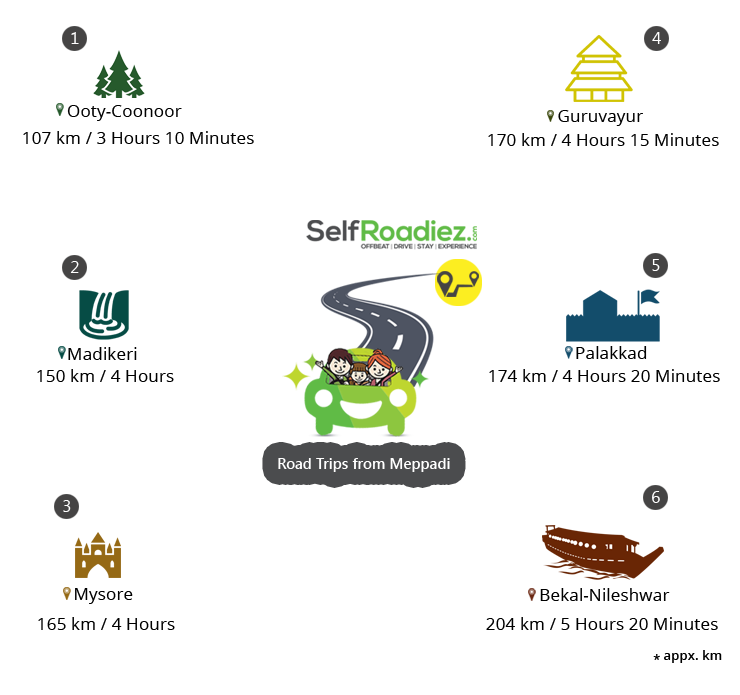 Meppadi lies on the State Highway between Ooty in Tamil Nadu and Kozhikode in Kerala. 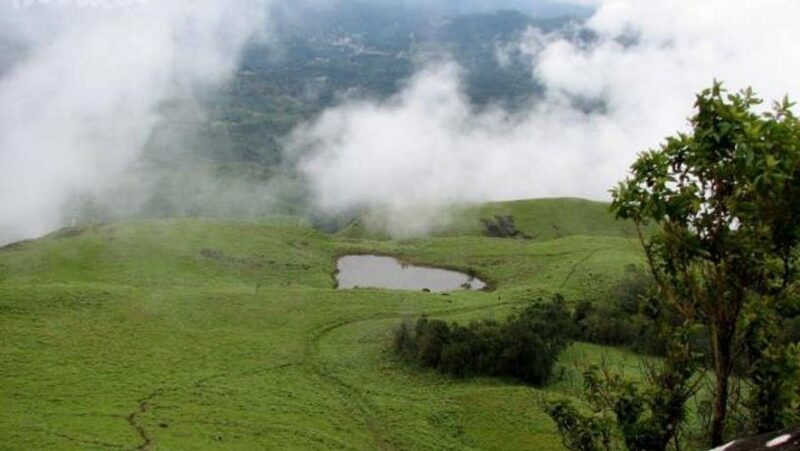 The rolling, undulating green hills of Meppadi are one of the most picturesque areas of the Wayanad region, which has been inhabited for more than 3,000 years. Although various tribal communities have always been part of the Wayanad district, Meppadi has mostly been a trading town, relying on tourism and tea cultivation, which is the chief economic activity of the village. The people of the village also indulge in a fair amount of vegetable cultivation, especially for plantain, ginger, and pepper. However, most of them are field and factory workers on the various tea estates in the region. While the women do the plucking of the leaves on the estate, the men are responsible for the weeding and other work. Most of the plantation companies provide accommodation facilities for all those labourers who depend on their job for a living. Other plantations in the area include those of vanilla, coffee and rubber as well. Meppadi is known for its proximity to the Chembra peak, the highest peak in The Wayanad region. The Meppadi hill is a popular place to indulge in a spot of trekking. Undoubtedly, the best time to visit Meppadi is during the monsoons, when heavy rainfall leads to the forests turning various shades of green. The average temperatures in the monsoons (May-August) is around 17 degrees Celsius. Winters in Meppadi are equally great, with average temperatures being in the range of 16-21 degrees Celsius. In fact, Meppadi receives a fair bit of rainfall even in the month of November. The nearest airport is at Kozhikode, around 95km away. The nearest railway station is also at Kozhikode, around 80km away. Ooty (a.k.a. Udhagamandalam) and Coonoor are one of the most popular hilly destinations in South India. Nestled in the undulating green tea plantations and pine forests of the great Nilgiris, travelers to Ooty and Coonoor can do a whole lot of activities in the region. For those wishing to go slow, they can go boating in Pykara Lake, enjoy the views at Silent Valley and Doddabetta, smell in the sweet smell of flowers at botanical gardens and ride on the Nilgiri mountain railway. Adventure-seekers can indulge in hiking, trekking, angling, fishing, mountain biking, etc. when it comes to Coonoor, the best thing to do is to visit the tea plantations and pick up exotic and different varieties of wonderful-smelling tea. The picturesque Madikeri (anglicised as Mercara) lies in the Coorg district of Karnataka and has had the repute of long being associated with the devout and powerful Haleri kings of the Kodagu region. Madikeri is known to have been originally named after the Haleri monarch Mudduraja, being famously known as Mudduraja’s town (‘Mudduraja keri’) in the 16th century. Travelers can enjoy scenic views of the surrounding forests and the valley from the Raja’s Seat atop the hill. One can also visit the Abbey Falls, Omkareshwara temple, Madikeri Fort, and St. Mark’s Church. Get a glimpse of Karnataka’s rich cultural past in Mysuru or Mysore, which is home to royal palaces, lush green gardens, temples and is a perfect cultural holiday destination. The city is the famous former administrative seat of the Wadiyar Dynasty and later Tipu Sultan’s kingdom as well. Mysore’s star attraction is the grand and imposing Mysore Palace, famous for its paintings and architecture. Travelers can also visit the sprawling Brindavan Gardens, the Chamundeswari temple at Chamundi Hills, St. Philomena’s Cathedral, Mysore Zoo, Jaganmohan Palace, and the exciting rail museum. A visit to the 5000-year-old legendary temple town of Guruvayur is a must when one is traveling to Kerala. Travelers must visit the famous pilgrimage site of Shree Krishna Temple in town, which is supposedly the country’s fourth largest temple in terms of devotee numbers. The temple also has a 33 meter-high gold-plated Dwajastambham as well as a 7 meter-tall Deepastambham. One must also visit the Punnathurkotta elephant sanctuary where elephants have been venerated and revered for decades, as well as the St. Thomas Syro Malabar Church and the Mammiyoor temple. Palakkad is famously known as Kerala’s ‘Rice Bowl’ due to the numerous rice and paddy fields in the lush-green region. The region is also home to the to the famous ‘Palakkad Gap’ between the Nilgiri and the Anaimalai mountains. Travelers can check out places such as the Malampuzha Gardens and Dam, the Rock Gardens, the Palakkad and Tipu Sultan’s Forts, the stunning Seethargundu viewpoint, the Kalpathy heritage temple complex and the Parambikulam Wildlife Sanctuary. Travelers must visit the gorgeous beach towns of Bekal and Nileshwar in the Kasaragod district of Kerala. One can stay on the many houseboats or enjoy cruises on the Nileshwar backwaters, enjoy scenic views of the Nileshwar harbor, trek in the Kottencherry hills and visit the Azhithala and Thaikadapuram beaches. In Bekal, travelers can visit the Nityanandashram caves, the Bekal and Chandragiri forts, the Vayaliparamba backwaters and the Kappil and Bekal fort beach. Travelers can trek to Chembra peak, enjoy scenic views at Pookot Lake, visit the Edakkal caves, Meenmutty and Kanthanpara waterfalls, and the famous Sentinel Rock Waterfall. Travelers can stay in the many jungle and forest resorts of Meppadi, which have gorgeous locales with scenic views of the tea plantations and forests around. Travelers can also opt to stay in guesthouses and homestays, which are gaining popularity in Meppadi as tourists throng the region for a laid-back holiday. Here is our verified pick of accommodations in this region for travelers seeking a relaxed & rejuvenating holiday experience. The accommodation at this Exclusive Resort Stay at Meppadi is of wooden cabins that merge with the surroundings. Luxurious independent cottages and tree houses offer a tranquil retreat amidst the spectacular scenery. Scenic Homestay at Meppadi is a luxury villa, resembling a planter’s bungalow, and comes with all the amenities needed for a comfortable stay with views that are jaw-dropping and let you merge with nature, completely cut off from the hustle of city dwelling. The spacious rooms have comfortable beds and cozy linen to kick back and relax after an eventful outing to the neighboring attractions. En-suite bathrooms are spotless and opulent. Nature is at its rawest and purest best at this Forest Resort at Meppadi. The mist melting against the massive trees of the rainforest and the cardamom plantations creates a surreal sight and here silence echoes peace. Accommodations at the Best Forest Resort at Meppadi have an elevated view of the vistas around. This Resort boasts of 2 suites, 2 wooden cottages, 2 villas, and a tree house. Every room is well-appointed with modern luxuries. Suite rooms have an indulgent open sky bathroom and garden. Wooden tree houses are exotic as they overlook the stream. The villas are ravishing in look and styling and have a living space, kitchenette, and dining area, apart from other comforts and luxuries. All accommodations are tastefully decorated with warm tones of furnishings and ooze elegance and panache. Trekking to Chembra peak is a thrill like no other, especially since it’s the highest peak of the Wayanad region. However, travelers will require permission from the Forest Office in Meppadi in order to travel and trek up to the peak. Meppadi is one of the most scenic parts of the Wayanad region, and if you’re looking for the perfect holiday in the Keralan hills, then this is the place to go to.